Denne Magiske Amuletten er kjent for "Helse, Mot og Beskyttelse"
Made of fine pewter nickel free, with cord. In religion and art, the cross is the richest and most enduring of geometric symbols, taking many forms and meanings thorugh history. It is both the emblem of the Christian faith and a more ancient and universal image of the cosmos reduced to its simplest terms - two intersecting lines making four points of direction. These stood for the four cardinal points, and the four rains-bearing winds, the four phases of the moon, and the four great gods of the elements. The arms of the cross could be multiplied to six or eight. in China, a cross within a square represented the earth and stability. The cross was also a summary of the Tree of Life. 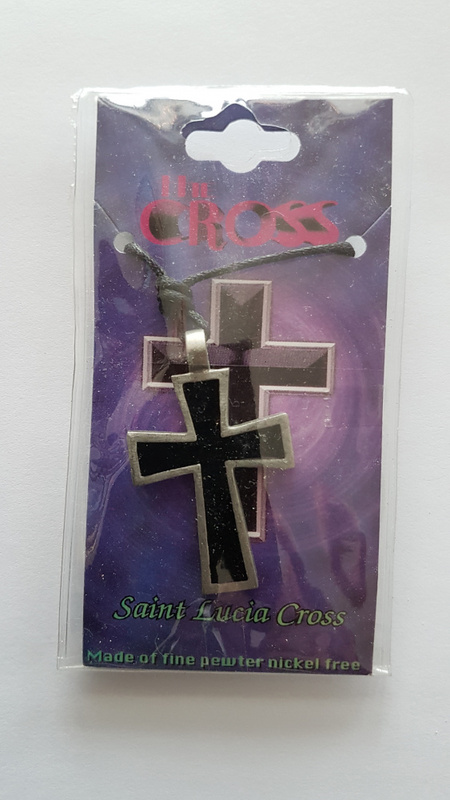 Christians believed that Christ's cross was constructed from the Tree of Knowledge, so the cross gained symbolism as the instrument of human redemption. The vertical axis of the cross has ascensional meaning, while the horizontal axis stands for earthly life. The form of the Celtic Cross, incorporating a circle at the center of the crossbar, appears to synthesize Christian and Pagan cosmic symbolism. In the Roman, Persian and Jewish world, the crusifixion was the brutal and humiliating instrument of execution for non-citizens such as slaves, pirates and criminals. The cross became dominant as Christianity spread, because it could inherit older cross traditions and give them profound new meaning - redemtion through Christ's self-sacrify.